Discover a whole new glittering electric blue world in Triple Topaz as you uncover the stunningly beautiful gems in this glamorous gemstone game. Your fortune may have just taken a turn for the better with this game as you reap the rewards from the high-value gemstones as you spin the glimmering reels of this onlineslots. The theme is consistent throughout the game, which has a truly luxurious look and feel to it. One thing is for certain, you’ll have a gratified glint in your eye once you see your winnings. 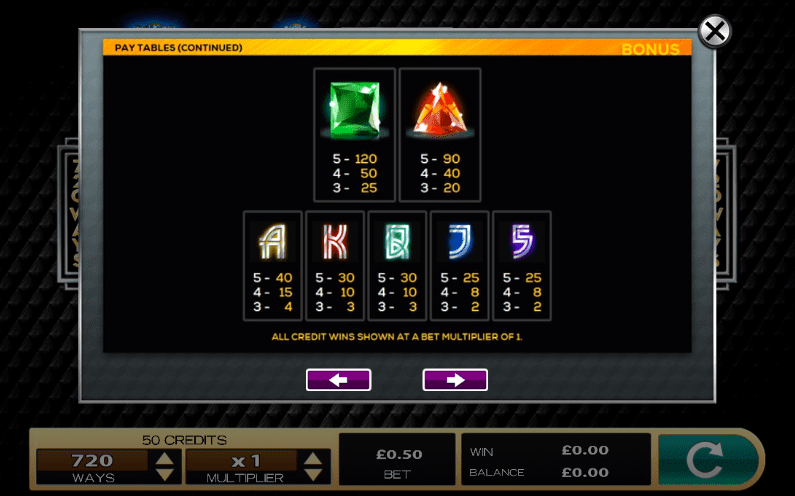 Although Triple Topaz is new in the business, it's already among the top-rated slot games online. It is launched in 2018 and comprises 5 reels and is played across an impressive 720 pay lines. A large number of pay lines mean there are myriad opportunities to win big in this game if you want to play across a large number of pay lines. To trigger this feature, all you have to do is to land 3 or more Free Games symbols in any position on reels 2, 3 and 4. Once you have succeeded, you will be rewarded handsomely with 6 free bonus games! Keep your glittering eyes peeled for the Wild symbol, which acts the same as it does in other slot games, by replacing all other symbols with the exception of the Scatter symbol. You will find the elusive Wild symbol on reels 2, 3, 4 and 5 and if you’re lucky enough for the Wild symbol to replace the signature Topaz symbol, it’s value will be tripled - giving the game it’s a namesake. There is a Split Topaz symbol feature where the Topaz symbol will appear anywhere on the reels and can appear as a split symbol and again can triple to give you even bigger prizes. Lastly, watch out for the Find your Fortune symbol, as if you land 3 or more of these beauties on reels 2, 3 or 4, this will trigger the Find your Fortune bonus round. In this bonus round, you choose a Topaz symbol to unveil what mysterious prize is in store for you. The visuals in this game are exquisite and you can really take advantage of the glittering rewards through the fun and lucrative free games bonus features. 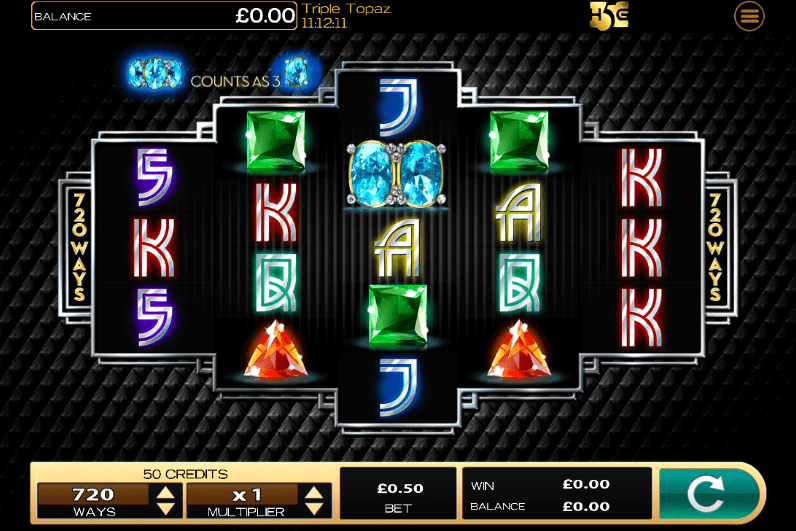 As you can adjust the paylines in this game, Triple Topaz is a perfect game for both beginner and more intermediate players with a bigger stake budget. The handy autoplay option allows you the opportunity to sit back, relax and be bedazzled by the sparkling gemstones rolling around the reels, as they spin automatically to rack up your winnings. A gem of a game! If you enjoyed playing Triple topaz, why not play Triple Dragons?